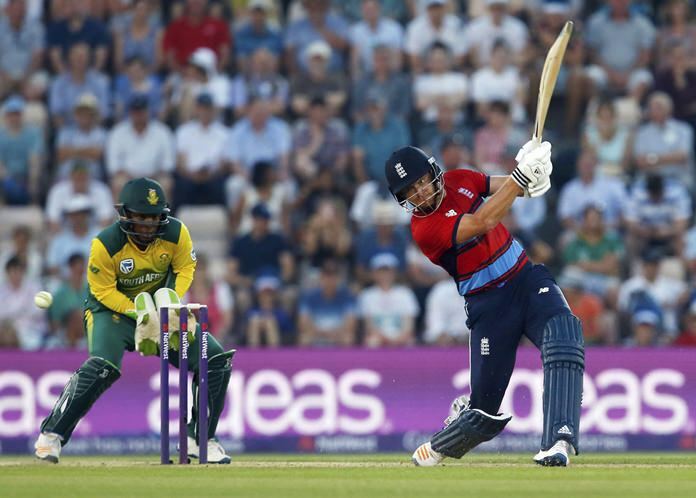 Southampton, England (AP) — England were on top from the first ball in a resounding nine-wicket win over South Africa on Wednesday to open their three-match Twenty20 series. David Willey removed JJ Smuts first ball of the game, Mark Wood dismissed Reeza Hendricks first ball of the second over, and England made light work of South Africa’s 142-3. England strolled to 143-1 and victory in just 14.3 overs, with Jonny Bairstow drilling six fours and two sixes in his 60 not out from the No. 3 position. Alex Hales made 47 not out off 38 balls. While Willey (1-34) and Wood (2-36) had the breakthroughs for England, spinners Liam Dawson and Mason Crane, who was on debut, put the brakes on South Africa’s batsmen and were pivotal in restricting them to such a poor total. Bairstow’s 60 came from 35 balls, propelling England over the line in an undefeated 98-run stand with Hales and making certain the home team were dominant right to the end. England had 33 balls to spare and didn’t even need to call on the likes of captain Eoin Morgan, Jos Buttler and Sam Billings. “To be honest, I thought we were excellent,” Morgan said. Standing in as South Africa captain, AB de Villiers opted to bat first on what he thought would be a good pitch. It began to unravel for the Proteas straight away. Willey forced the first delivery past Smuts and onto his stumps after deflecting off the batsman’s shoe. Wood had Hendricks caught by Willey playing a pull shot first ball of the second over. Wood also collected the wicket of David Miller to an inside edge through to wicketkeeper Buttler. De Villiers (65 not out off 58 balls) and Farhaan Behardien (64 not out off 52) made half-centuries but England’s bowlers had them under control throughout, with the South Africans unable to hit boundaries with any regularity. That wasn’t an issue for England. Jason Roy hit three fours and two sixes — one a huge sweep over the backward square leg boundary — before he was the only England dismissal, out lbw trying to play a reverse sweep. He made 28 off 14. Hales also hit three fours and two sixes and South Africa crumbled in the field with a succession of mistakes. In one of their worst, Behardien dropped Hales in a clumsy effort near the long-on boundary. Hales smashed the next ball for six. “Difficult to sum up a performance like that,” De Villiers said.